If you are interested in the Cadence Cloggers entertaining at your event, please fill out the form below and submit. Our schedule fills rather quickly. So, ideally we would like at least 60-90 days notice of an event, but exceptions may be made. Our normal performances are about 45 minutes to an hour. They include line and partner dances to a variety of music - from country to 80's to pop. 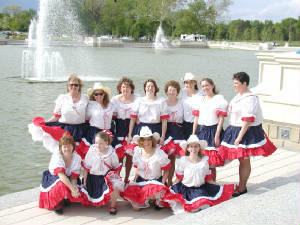 We are a non-competing, not-for-profit group who clog for the sheer joy of the dance. Donations are welcome. *None of the below is required. However, the more information you provide us, the better we can answer your questions. Thank you for your interest in the Cadence Cloggers.